Q:How do I replace the battery on the TS5? 4. Install the CR2032 battery with the terminals correctly placed as described in the manual or in the illustration below. 7. Make sure the battery cap is closed securely. The LED indicator should blink once to indicate that the battery has been replaced. Q:How do I pair the TS5? 1. Before installing the TS5: verify its mode of operation - speed mode (blinking red) or cadence mode (blinking blue). After the battery has been replaced, the color of the Xplova indicator light can be used to distinguish which mode the TS5 is currently operating in. 2. If the light does not glow steadily, but switches off after blinking five times, it means the battery level is under 30%. It is recommended that the battery be replaced with a new CR2032 battery. For instructions on replacing the battery, please refer to the manual or FAQ. 3. Move within 1-2m of the Xplova device with which you want to pair, then shake it lightly to wake up the sensor. 4. Refer to the Xplova device manual for pairing instructions. Add the TS5 sensor to your device according to its current mode (speed or cadence). For more information on pairing the sensor, please refer to the user manual. 5. If the device still fails to pair, please consider replacing the CR2032 battery inside the sensor. For instructions on replacing the battery, please refer to the TS5 manual. 6. If the device still fails to pair after installing a new battery, please contact your local distributor. 7. 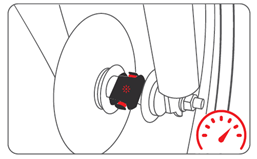 After pairing, please install the TS5 on the appropriate part on your bike according to its mode. Q:Can the TS5 detect speed and cadence at the same time? How many modes are there? No. The TS5 can only operate under either speed mode or cadence mode at any given time. It cannot operate both modes at the same time. To switch the mode of operation, please remove and reinstall the battery. Q:How do I install the TS5? The TS5 can operate in two modes: speed mode and cadence mode. Please refer to the steps and illustrations below when installing. 1. Make sure the sensor is in speed mode. If unsure, please remove and reinstall the battery to verify. Under speed mode, the TS5 indicator should glow red after the battery is installed. 2. Prepare the thicker piece of curved rubber pad with extrusions on both sides to align against the openings on the back of the sensor. Use the larger rubber ring to hook onto the extrusions on the two ends of the sensor to secure it onto the hub of the bike. 1. Make sure the sensor is in cadence mode. If unsure, please remove and reinstall the battery to verify. Under cadence mode, the TS5 indicator should glow blue after the battery is installed. 2. Prepare the thinner piece of rubber pad with extrusions on both sides to align against the openings on the back of the sensor. Use the smaller rubber ring to hook onto the extrusions on the two ends of the sensor to secure it onto the crank arms of the bike. 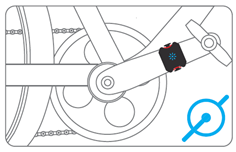 After installation, please turn the crank arms or both the front and back wheels several times to wake the sensor, then refer to the bike meter device manual for further information on pairing. Speed/cadence sensor (with a CR2032 battery pre-installed), rubber pads, rubber rings, and the user manual. Q:What type of cycling meter or app protocols can the TS5 pair with? Q:Can the TS5 be charged? The TS5 uses a CR2032 button cell battery which cannot be charged. Q:What is the battery life on the TS5? A new CR2032 battery lasts for approximately 300 hours. With the frequency of one-hour sessions per day, it will last for about 10 months. Q:Where can I find the detailed specifications of the TS5? For the detailed specifications of the TS5, please visit the Xplova website (www.xplova.com). Q:How does the speed/cadence sensor work? How long is the product warranty for TS5? Six months warranty from purchase by the consumer (2 years for the EU countries). Proof of purchase is required. After the warranty period, will repairing an Xplova related device incur additional charges? If the warranty period has expired or the repair is outside of the scope of the warranty, then there will be additional charges for parts and labor. The relevant customer service personnel will provide you with a quote on the charges.